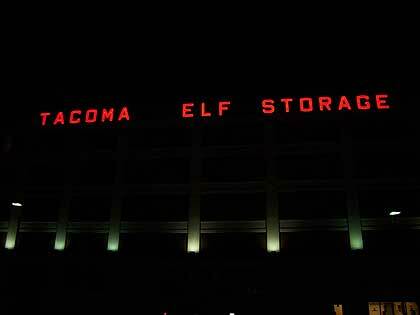 Sure enough, as we made our way back home from Thanksgiving, we were on the look out, and saw that the "Tacoma Elf Storage" was back! We were so excited, we actually cheered! I hope they keep it up every year so John can learn to appreciate it! Until we drove another 50 miles or so. Andrew noticed that the car was getting hot again. We made it safely to Bellingham and decided to take the car in again on Friday. Thanksgiving day was SO wonderful! We woke up to a flurry of snow falling from the sky with about 2 inches of fresh snow on the ground. I love the feeling of being stuck at home when I have no where to go! I provided the mashed potatoes, as I have for 3 years in a row, and they were very yummy! (I'm a sucker for good mashed potatoes). Mom St.Hilaire cooked a feast! Jenna brought the green beans. It was a very delightful dinner, with exceptional company! There was a crazy rain and wind storm on Thursday night. When we woke up, there was hardly a trace of snow on the ground! On Friday we took the car in again. They told us it wasn't going to be finished until Monday. We were supposed to leave on Saturday morning because I had a baby shower to go to back home. I was very sad to have to miss the shower, but it was nice to have a couple of extra days with Andrew's family! I was also able to catch up with a few friends. While we were there we watched the movie Karol: A Man Who Became Pope. It was so inspirational and I highly recommend it. I was worried that the actor playing Karol would not be good enough to play the role, but I was quite impressed by him. Watching this movie made me think about what really matters in life: our relationship with God! It was appropriate to watch for Thanksgiving, because it reminded me of how thankful I am to be part of such a wonderful Church! We picked up the car on Monday and headed home... only to see that the engine was still getting hot. =( We're not sure what to do now.